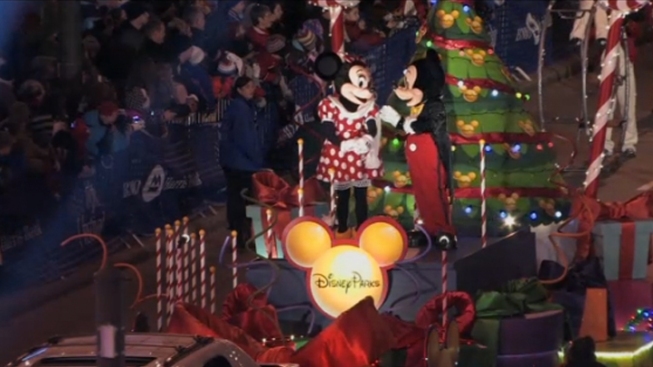 Mickey and Minnie Mouse wave to parade-goers during the 2011 Magnificent Mile Lights Festival. Chicago's annual Magnificent Mile Lights Festival and Parade officially kicked off the holiday season on Saturday evening. The parade, dubbed the nation's largest holiday event, strolled south on Michigan Avenue. Presented by BMO Harris Bank, the show prominently featured Disney characters, including Mickey and Minnie Mouse, as well as performers from Radio Disney. The Greater North Michigan Avenue Association estimated there were about 1.2 million people in attendance. The all-day event started at 11 a.m. with live concerts from family-friendly bands like The Never Land Pirate Band and gospel group Mary Mary. Event-goers also enjoyed activities, food and a meet and greet with Santa at Pioneer Court. The night concluded with a firework display over the Chicago River at Michigan Avenue and Wacker Drive. Time-Lapse Video: We've sped up video from our tower cam to show Michigan Avenue being closed to traffic and parade-goers taking over for the Magnificent Mile Lights Festival.